Bettina von Arnim was born at Frankfurt am Main, into the large family of an Italian merchant. Her grandmother, Sophie von La Roche, was a novelist, and her brother was Clemens Brentano, the great poet known for his lyric poems, libretti, and singspielen. He was a mentor and protector to her and inspired her to read the poetry of the time, especially Goethe. After being educated at a Ursulines convent school in Fritzlar from 1794 to 1797, Bettina lived for a while with her grandmother at Offenbach am Main and from 1803 to 1806 with her brother-in-law, Friedrich von Savigny, the famous jurist, at Marburg. She formed a friendship with Karoline von Günderrode. The two friends acknowledged only natural impulses, laws, and methods of life, and brooded over the “tyranny” of conventionalities. In 1806, Günderrode committed suicide on account of a passion for the philologist Georg Friedrich Creuzer. In 1807 at Weimar Bettina made the acquaintance of Goethe, for whom she entertained a significant passion, which the poet did not requite, though he entered into correspondence with her. Their friendship came to an abrupt end in 1811, owing to Bettina's behaviour with Goethe's wife. In 1811, Bettina married Achim von Arnim, the renowned Romantic poet. The couple settled near Berlin and had seven children. Achim died in 1831, but Bettina maintained an active public life. Her passion for Goethe revived, and in 1835, after lengthy discussions with the writer and landscape gardener Hermann von Pückler-Muskau, she published her book Goethe's Correspondence with a Child (German: Goethes Briefwechsel mit einem Kinde), which purported to be a correspondence between herself and the poet. The book is in large part fictitious. Genuine sonnets of Goethe in it were addressed, not to her, but to Minna Herzlieb. As a work of fiction, the book has been praised. 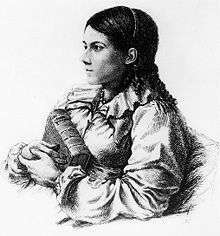 She continued to write, inspire, and publish until 20 January 1859, when she died in Berlin, aged 73, surrounded by her children. During the years of 1806 to 1808, von Arnim helped gather the folk songs that comprised Des Knaben Wunderhorn, the collaborative work of her brother and her future husband, Achim von Arnim, later put to music by Gustav Mahler. The collection became a touchstone of the Romantic musical and poetic style. From 1808 to 1809 she studied voice, composition, and piano in Munich under Peter von Winter and Sebastian Bopp. She published her first song under the pseudonym Beans Beor, which she occasionally used later as well. Bettina sang briefly in the Berliner Singakademie and composed settings of Hellenistic poems by Amalie von Helvig. Though domestic duties connected to her 1811 marriage to von Arnim diminished her productivity, several art songs from the period have been recovered and have been published in Werke und Briefe. Von Arnim was the first composer to set the poet Hölderlin’s work to music. She was a muse to the progressives of Prussia, linked to the socialist movement and an advocate for the oppressed Jewish community. She published two politically dissident works but evaded chastisement because of her friendship with the King of Prussia. After the 1831 death of her husband, Bettina continued her dedication to the creative community. She published a collection of seven songs in public support of Prussian music director Gaspare Spontini, under duress at the time. The German-American settlement of Bettina in the state of Texas was founded in 1847 and named by its progressive, idealistic founders after Bettina von Arnim. Located near the joint of Elm Creek and the Llano River, it lasted only a year. No trace of the Bettina community survives, though two of its three founders, Gustav Schleicher—later a U.S. congressman and namesake of Schleicher County—and Dr. Ferdinand Ludwig Herff, who in 1854 became the first surgeon to use anesthesia in Texas, subsequently became prominent. The community's third founder was Hermann Spiess. Part of von Arnim's design for a colossal statue of Goethe, executed in marble by the sculptor Karl Steinhauser (1813–1878), was displayed in the museum at Weimar in 1911. From 1991 until 31 December 2001, her portrait was printed on the German 5-Mark bill. In 2006, the German government turned Künstlerhaus Schloss Wiepersdorf, von Armin's matrmonial home, into a literary institute. The institute contains a museum devoted to the von Armin's literary legacy. ↑ Ripley, George; Dana, Charles A., eds. (1879). "Arnim, Ludwig Achim von". The American Cyclopædia. 1 2 3 4 Chisholm, Hugh, ed. (1911). "Arnim, Elisabeth (Bettina) von". Encyclopædia Britannica (11th ed.). Cambridge University Press. 1 2 Gilman, D. C.; Thurston, H. T.; Colby, F. M., eds. (1905). "Arnim, Elisabeth von". New International Encyclopedia (1st ed.). New York: Dodd, Mead. ↑ Hirsch, Helmut (1987). Bettine von Arnim (in German) (6th ed.). Rowohlt. ISBN 978-3-499-50369-6. ↑ Lyman Wight's Mormon Colony in Texas excerpt from "Mormon Trails" chapter in Hill Country travel guide by Richard Zelade. Accessed 6 August 2007. ↑ "Schloss Wiepersdorf" [Castle Wiepersdorf] (in German). Retrieved 2015-04-17. ↑ "Künstlerhaus Schloss Wiepersdorf" (in German). Retrieved 2015-04-17. Wikimedia Commons has media related to Bettina von Arnim.